The World Health Organisation (WHO) defines mental health as 'a state of wellbeing in which the individual realises his or her own abilities, can cope with the normal stresses of life, can work productively and fruitfully, and is able to make a contribution to his or her community.'. In other words mental health is a level of cognitive or emotional well-being. To be mentally healthy is to be absent of a psychological/mental disorder. Cultural, social and professional differences can affect how mental health is defined and individually assessed. There are a range of mental health problems and disorders including depression, anxiety, bipolar and schizophrenia. Good mental health, like physical health, is not constantly stable throughout an individual's life and is dependant on situations and support. 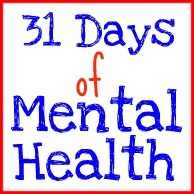 Why 31 Days of mental health? I'm passionate about mental health, psychology. I've completed a Diploma in Community Welfare Work where I did work experience at a mental health unit during Mental Health Week. I learned a lot about the system, myself and mental health. I also did work experience at a detox which fuelled my desire to open a dual diagnosis clinic in Queensland. I've decided to use 31 Days of... for awareness of something that affects everyone yet still isn't spoken like it should be. I believe that one person can make a difference even if it's just a difference for them and their family. Plus I love a challenge! What are Mental Health Month and Mental Health Week? Mental health Month is an initiative of the Mental Health Association of New South Wales. The Mental Health Month 2011 Theme is 'Wellbeing: Invest In Your Life'. The aim is to encourage a holistic view on health and wellbeing. An individual's overall wellbeing includes mental health, physical health, spiritual health, social health and community health. Mental Health Month is yet to go nationwide but Mental Health Week is nationwide in October. I'm from Queensland so during Mental Health Week, 9-15 October 2011, I'm going to be focusing on Queensland's awareness programs. 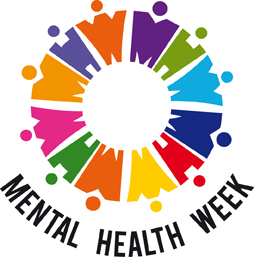 The aim of Mental Health Week is to encourage discussion, raise awareness and reduce stigma of mental health. Earlier this year Queensland was affected by almost state-wide natural disasters including my city of Brisbane. The theme for QLD Mental Health Week ties in with these disasters, 'You Lent a Hand, Now Lend an Ear'. I'll be focusing more on this during Mental Health Week. World Mental Health Day is on during Mental Health Week on Monday 10th October. The theme for World Mental Health Day is 'Mental health and long term illness: The need for continued and integrated care'. I'll be covering more on what that means on that day. Please join me on my month long journey of Mental Health. If you have any questions you'd like answered please contact me. I am not and do not claim to be a health professional. If you need help please contact the above links or Lifeline on 13 11 14. I really love reading about what other bloggers are passionate about. For the rest of Australia it's easy to forget about the floods, and that people are still suffering, but of course they are. Thank you for bringing awareness to this topic. it's such an important one, and I admit your dedication to it. Thanks for showing me the way with your invitation to write about Mental Health... Because I'm now making it a focus too, with NSW activities to report on. You have a great goal in mind...and from what I see the determination and motivation to achieve. I look forward to catching up here too. 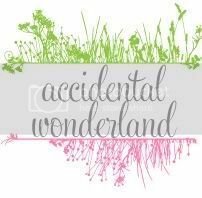 Thanks for joining the October Mental Health Blog Hop. I love how passionate you are about Mental Health Ames - I love that you are dedicating your blog space for the whole month!